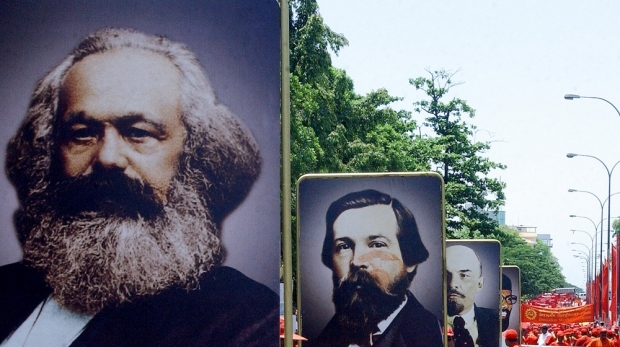 Likenesses Marx, Engels, and Lenin lead a labor day parade in Sri Lanka. In China, calls for Marx to remain central continue and have recently intensified after speeches by President Xi Jinping. Yet at the same time, reports of Marxism’s death are greatly exaggerated. While more left-wing publications such as Red Flag Manuscripts, a more strident journal associated with the Central Propaganda Department’s theoretical magazine Seeking Truth, have never ceased flying the socialist banner, recent reports point at an increasing priority given to ideological issues. Journalists, for instance, are now required to take courses on Marxist philosophy, while the topic remains a mandatory course in Chinese university curricula. According to Xi Jinping himself, Marxism must remain the ideological lodestar of the Chinese state. Both the Party Constitution and the State Constitution indicate that Marxism-Leninism provides the correct scientific basis to govern the country. The question of how much influence Marxism (and Leninism) stills has in contemporary China is thus more than merely academic. First of all, however, one must be careful in ascribing certain traits to Marxism alone. Many of the traits that we have to come to associate with the Chinese version of Marxism can often be drawn back to China’s imperial political culture. In fact, one could argue that one of the reasons Marxism was so attractive to the modernizers who built up the Party during the 1920s was because it provided an intellectual tool to transform society that shared some of its crucial components with Chinese political concepts that they were well acquainted with—in many cases because they had been educated with the classical Confucian canon or grew up in scholar-official families. Marxism’s focus on the realization of a utopian society, for instance, was not too dissimilar to the Confucian yearning for Grand Harmony. Similarly, the Leninist idea of rule by knowledge elites resonated among thinkers for whom the imperial examination system was anything but a distant memory. Second, it is necessary to understand the whole meaning of the term “ideology.” Ideology is perhaps best understood as a set of interrelated concepts that claim to provide an explanation for the way the world is, as well as a recipe to transform it. These concepts operate at two levels: one programmatic and one epistemological. At the programmatic level, we find the answers to questions on how the economy should be structured or how the State should operate. These include, for instance, whether there should be a free market or a planned economy; whether officials should be appointed through popular election or elite decision; and whether property belongs primarily to the individual or to the state. In turn, these answers rely on the assumptions made at the epistemological level, which provide fundamental statements about the nature of humans, their interactions, and their societies. One key tenet of liberalism, for instance, is that individuals are best able to arrange their own lives autonomously. Consequently, government should only intervene in individual liberty under specific conditions, including the prevention of harm to others. Marxism-Leninism, in contrast, posits that most members of the working class are unaware of their oppressed state, and thus need education by a vanguard party. Most discussions about ideology tend to focus on the first level, while the second often remains unexamined. Yet these epistemological beliefs constitute the basic assumptions that come into play when political decisions are made. They form the “common sense” or sense of normality under which political decision-makers act. What are the most important ideological elements that remain current in Chinese politics and society? I would suggest at least the three following: historicism, positivism, and monism. The historicism takes the form of the idea that the Party is proceeding towards a determined historical objective along a predefined path of historical development. This objective has, at various times, been referred to with words such as Communism,” the harmonious society” or the “Chinese Dream,” but in all cases, the assumption is that the future will bring a utopian society in which all social conflicts have ceased and everyone is spiritually and materially happy. Yet this process is not automatic: in order to attain this future state of bliss, it is necessary to have the right plan, as well as exert the efforts needed to propel society along the rails of history. This is where positivism comes in. Positivism is the idea that social reality, like nature, is undergirded by a single set of objective, intelligible laws and rules that cannot merely be used to understand reality, but also to control and change it, in order to achieve progress. In Party parlance, such laws (guilü) must be discovered through diligent scientific research, so that legal and policy measures can be established that solve present problems in accordance with social laws of development. In his speech at the recent 4th Plenum, Xi Jinping stated that, “The core of scientific legislation lies in respecting and reflecting objective laws.” At the most abstract level, the Party claims it is guided by Marx’s historical materialism, where successive stages of history end in crisis and revolutions, due to their internal contradictions, until the nirvana of Communism is reached. One can speed up this process by identifying the tasks that need to be fulfilled in any particular stage. In his interpretation, Mao Zedong posited that every era is characterized by one particular “primary contradiction,” which determines all smaller contradictions in society, and must be solved in order to proceed to the next level. For Mao, that crucial element was class struggle. Monism, as discussed by Isaiah Berlin, means to assume that there is only one set of legitimate values, preferences, and interests in a society, which exist in harmony. The past few years have seen the development of the socialist core value system, now peddled in enormous wall posters and online campaigns, and extolled regularly by top leaders. The assumption is that this “system” is a set of mutually interlocking values that, if they are all observed, will provide spiritual drivers for development, and energize the population to continue to toil for the realization of the Chinese Dream. Chinese-style monism also tends to overlook the difference between sources of norms. Many societies recognize considerable differences between, for instance, legal and social norms (where something is in poor taste or improper, but not illegal). In China, such divergences are often elided. One example of this is the paternalism one often sees in cultural policy: if a particular film or television program pleases the powers that be in the propaganda bureaucracy, it is automatically assumed that the people will like it as well. Conversely, if it contains elements that offend the censorship mandarins, it must be barred from accessing the market. Another example is the notion that “scientific” policy proposals are automatically assumed to be “democratic”—what is true according to objective laws cannot be different from the popular will and vice versa. In other words, to any policy question there is only one single correct answer that is scientifically true, democratically valid, and ethically just. These elements allow us to identify the nature of Deng Xiaoping’s ideological shift away from the ideological extremism of the Mao era, towards a more pragmatic and facts-driven approach to development. Rather than a change of paradigm, Deng’s efforts should be understood as a reinterpretation of these core ideological tenets. Two elements in particular stand out: Deng redefined the primary contradiction, and he redefined the standard for defining political truth. Where Mao had consistently argued that class struggle must remain the central political cause, and must be solved by permanent revolution, Deng stated that after three decades of class struggle, few class enemies remained. Rather, the brunt of the Party’s work should be directed towards resolving the contradiction “between the ever-growing material and cultural needs of the people and the low level of production,” as indicated in the Party Constitution. Furthermore, the test of rectitude would no longer require an exegetic reading of previous leaders’ writing. Rather, Deng introduced a clear commitment to evidence-based policy-making, as practice became the sole criterion of truth, and truth should be sought from facts. To a certain degree, adherence to these elements has enabled the astounding trajectory of development that China has experienced over the past 35 years. The identification of economic growth as the primary objective of Party rule, combined with a strong commitment to pragmatically adopt policies that have been proven effective in practice, has propelled China into second position in GDP terms. This is in stark contrast to the inability of many developing countries to—in fact—develop. Also, the technocratic nature of the leadership seems to have resulted in the fact that China is somewhat less plagued by the sort of religious zealotry that dominates U.S. politics, or the populism that has come to the fore in Europe. Consequently, everyday political battles are not fought over clear and diverging political stands, but at a technocratic level. The currency of Chinese politics is the ability to append specific objectives to broader policies, interpret particular terms, and define models, measurements, and indicators, for what is not counted does not count. One mundane example concerns taxis in Beijing: taxi rides are part of the basket of goods used to calculate inflation. As a result, the Beijing government has been reluctant to allow fares to rise, leading to a growing lack of cab availability. More importantly, ministries derive their authority to formulate certain policies from individual phrases in top-level policy plans. Therefore, the task for policy entrepreneurs is to ensure that either the correct language is present in the authoritative document, or that it can be interpreted to suit their needs at the level of execution. This reductionist view is, of course, not strange to anyone who lived through high modernism at its Corbusian best, or indeed has more than a working understanding of the impact of big data on individuals’ lives—the one salient point being that China lacks anything resembling robust resistance against the CCP’s project of wholesale transformation. Perhaps the best metaphor to understand the way the leadership sees China is as a French garden: geometrically perfect, rigorously planned, orderly, and aesthetically impressive. Gardeners rarely listen to the voices of the plants.